Sneak Peak Inside "Run Fast. Cook Fast. Eat Slow." Home › Journal › Sneak Peak Inside "Run Fast. Cook Fast. Eat Slow." Shalane Flanagan and Elyse Kopecky’s first running performance-focussed cookbook, “Run Fast. Eat Slow” transformed the lives of runners across the world. It The book has been so well recieved that it made the New York Times Bestseller list and inspired the duo to write a second book. The new cookbook, which comes out tomorrow (August 14, 2018), is chock full of nutrient-dense recipes that take very little time to make. So, your busy life is no longer an excuse not to eat well. In “Run Fast. Cook Fast. Eat Slow,” Flanagan and Kopecky show the way. Last week we caught up with Kopecky to learn more and score a sneak-peak recipe of one of Flanagan’s favorite dishes. You say the single most important thing any athlete can do outside of training is to learn to cook. Why do you think this is so important? Many athletes think of food just as fuel and come to depend on packaged foods that have the right macronutrients but are lacking in all the micronutrients and other things like antioxidants that you can only get from real food. Athletes need an incredible amount of nourishment for recovery. We now know that processed foods like protein powders are difficult to digest and not as readily used by the body as a whole foods form of protein like eggs or quinoa. Also, there is something very healing about cooking; it can be meditative and help with all sorts of other ailments, especially if you enjoy the prepared meal with friends and family. Your first book was incredibly well received. Why the second? Who will benefit from this book and how do you expect it to have a greater reach? Our fans inspired us to write a second cookbook because we learned so much from their letters, their emails and from meeting them while on our book tour. We heard from so many fans that our book had a life-changing impact. This is especially true for young women who suffered from disordered eating habits and food phobias, so we wanted to discuss those issues in the second book directly. We also wanted to create even easier recipes since our fans live busy lives with work, training, kids, etc. The second cookbook will appeal to beginner cooks and busy families. These are the recipes that fueled Shalane while training for the New York City Marathon and fueled me while pregnant with my second baby. When and how did you discover proper fueling, and then cooking, as a way to overcome health issues? I discovered the incredible change in my health when I began cooking nourishing meals to fuel my active lifestyle while working abroad in Switzerland. The food culture in Europe inspired me; anytime I traveled to another country (pre-kids) I always signed up for a local cooking class. Due to running competitively in college and not having enough healthy fats in my diet, I suffered from athletic amenorrhea for 15 years, and not one doctor suggested I change my diet. When I embraced the rich foods in Switzerland, I felt healthier and happier than ever before. And, for the first time, I got my period naturally without having to give up running. If you could offer three easy tips for making better use of the kitchen for runners who feel like they don’t know how to cook, what would you say? Sign up for a series of fun cooking classes with friends, especially a knife skills class. Plan your meals in advance and dedicate one afternoon per week to meal prepping. If you come home from a long day of work and already have rice cooked and chicken marinating in the fridge, you’ll be a lot more likely to take the time to cook. Discover how easy it is to make "Power Bowls” (wholesome rice bowls) and grain salads by following the DIY instructions in our new book. If an athlete could learn how to make just one thing, I would say Power Bowls are the most important recipe in "Run Fast. Cook Fast. Eat Slow." We’d love to share a recipe with our audience. Anything you’d like to share? 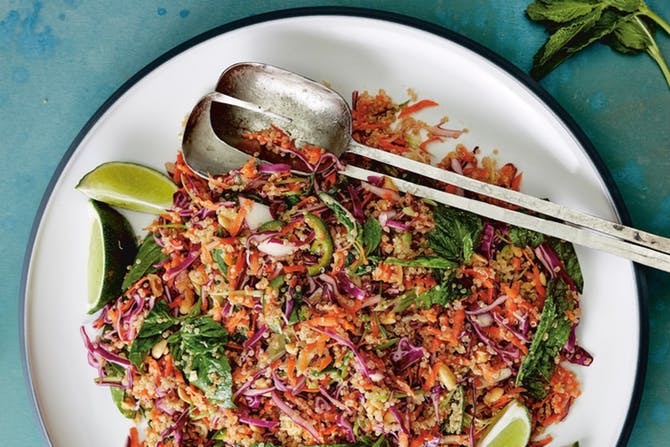 Yes, Thai Quinoa Salad. It was Shalane’s favorite while training for the New York City Marathon. THAI QUINOA SALAD from "Run Fast. Cook Fast. Eat Slow."